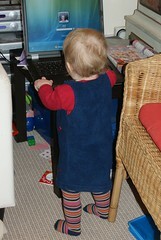 Anna and Amaia's blog: Leave me in peace so I can work out your password! Leave me in peace so I can work out your password! Mum gave me this nice computer. I am sure it is for me because I can reach it on the coffee table. That's why I hit all the keys every time I pass it. Funny though, I don't seem to be able to work out the password.